If you’re an artist, I’m sure many of you have heard this before. I’ve heard most of these first-hand or have been at least offered these kinds of deals MANY times. Not to say that SOME success stories haven’t come from deals like this, but unfortunately nine times out of ten they don’t work. As said before, the site was hacked. I’ve been fighting with it for a month or so now. I’ve managed to restore the site, but there’s still LOTS of kinks to work out. So hang on while I fiddle around with the site. No update today as you can see. Something super urgent has come up and I need to put my energy into that. But in the meanwhile I’d like to share a little tip to all you creators out there. 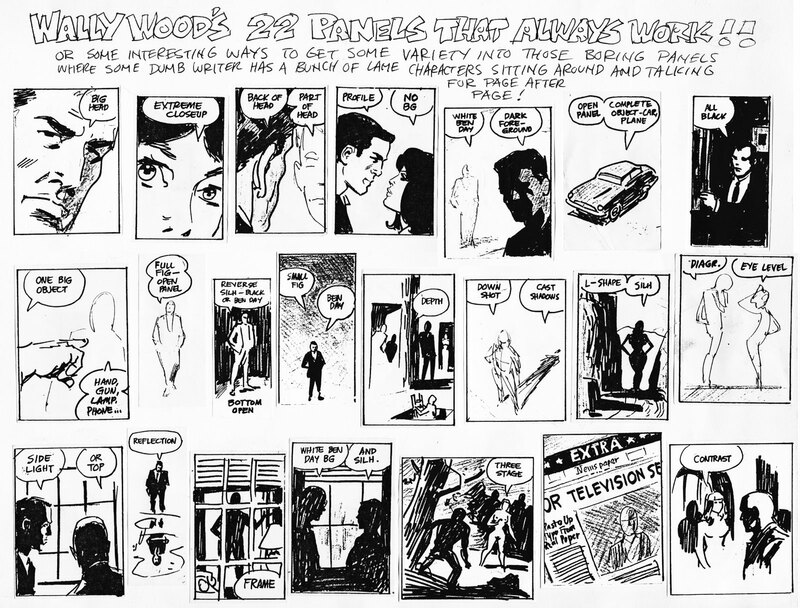 They’re a series of panel styles that Wally Wood made for himself back in the 70’s to prevent artistic block. To keep things looking fresh. They’re basically every type of panel you ever need. It’s been floating around for decades and when I ran into it a few years ago I immediately saved it. It’s printed out and pinned on my wall. I keep it there more as a reminder to change things around than as referance. I’m pretty sure that’s what Mr. Wood did too. This might be old news to a lot of you, but I’m sure that quite a few haven’t even heard of it and will find it useful. One of our readers (Zatoichi) brought it up in the comment section and I thought it was worth mentioning in the blog. So here you are. Just click the image, wait for the window to open and right click and save as. I had a great experience with Comicbreak, that I’d like to share with you. I bought myself some trade paperbacks as a Christmas present. Under NO circumstances would I buy them here in Finland!! A typical trade costs around 35€ ($48) here! So online was the way to go. There’s lots of comic book services out there. Probably the biggest, most popular being Discount Comic Book Service (DCBS for short 😉 ) For guys like me on the other side of the globe, they’re a blessing. I was originally going to order some books from DCBS because the guys over at ComicgeekSpeak are always talking about it. But then one of their podcast episodes was sponsored by a “newcomer” called Comicbreak. I went to check it out and was really happy with it. Like DCBS they also have lots of discounts and they have they’re site setup with things you see in a comic book store. Everything from a 99 cent bin to comic sets. You get 30% off pre-orders, up to 20% off subscriptions, free bags and boards! !, free shipping for orders over $75 and tons of other stuff. But onto my happy experience… So I chose to go with Comicbreak because, though I absolutely have nothing against the guys at DCBS, I really want to encourage the “little man”, the “newcomers”, because a lot of you know how it is to make it out there. I ordered five trade paperbacks: The Death of Captain America: vol.1-3, Captain America: The Man With No Face and Wildcats: Street Smart. I calculated that they’d be here just in time for Christmas. But then I got an email from them saying that all of the comics had come in, but that one of the Cap tradebacks was damaged. I sent an email back saying that I understood and that it was unfortunate, because I was really looking forward to some Christmas reading since these books are hard to get here. But that’s the way things go sometimes. Thanked them for contacting me and went on with Cristmas preperation. Then two days later I get another email telling me to hang on, they’ll send all of the books, damaged one too, so I can get started on my reading and then send the un-damaged book later! At first I didn’t know what to say. You DEFINATELY don’t get that kind of customer service here. All I could do was thank them from the bottom of my heart. Noise on the site? Still Hacked? I’ve been getting emails from people saying that the site is playing music and noise…! I don’t hear it on my computer or on our laptop so I was just wondering how many people hear stuff on the Heroes, inc site?